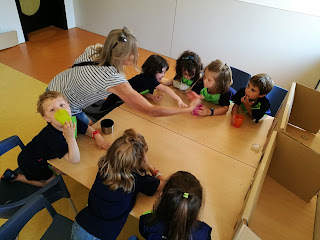 On our last two days we have been doing some special activities. We have made some rice balls with balloons, and we have also dressed up for our dream holidays. We have taken some nice shoots of our students in the beach, dessert, paradise islands, diving, doing extreme sports, in famous cities or even in a rocket as astronauts!!!! Here we leave you the link to have a look at some amazing photos! Have a wonderful and full of joy summer!!!! And finally, here it is the edited version of the interviewing/journalist activity from 4th grade. Last week, the topic we had been working on was landscape. We had done several exercises in which we learnt words like cliff, island, jungle, forest and so on. Providing that they already knew such words, we did this activity to remind the words in a funnier way. Here some photos where you can see your sons and daughters trying to "fish" pieces of paper from the floor using a magnet fixed to a rope. They got it! It's more difficult than it seems! Last week we did a more practical session: we wrote our name on a posterboard using plasticine. We smelled a nice perfume, we touched cold icecubes, we heard a sound , we saw animals,we tasted sweet cherries and salty salt. 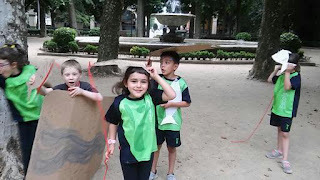 As well , like real indians we followed the footprints of different animals in the plaza Clara. 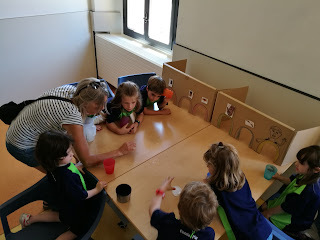 We couldn't finish the activity with the paper circle of the senses but if you want to do it with your child. They can draw different objects and you can ask . Can you smell it?? Can you taste it ? 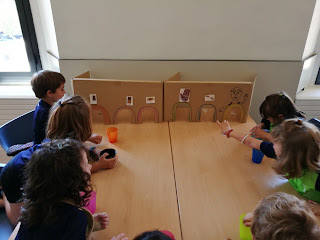 for example you can taste an apple , you can smell a flower etc..
We listened to the song ...on youtube...simple songs senses (it's the one with the apple !). I hope to add some pictures soon. Next tuesday will be the final party of English club. Bye Bye ....we had loads of fun learning together !!! It was fun ordering the food, cooking it and then even puting a price to the whole meal! Few week ago the spring arrived and we decide to study a little more in detail the topic of seasons of the year... singing! and off course they had time to have extra fun playing.. Continuing with the practice of interviewing, 4th graders have been preparing a set of questions for asking they to some teacher from the school so they can know more about them. Which TV channel do you like? Do you like visit cities? Do yo like Olot ? What is the name of your boyfriend? Which is your best friend name? Which TV channel do yo like ? Do you like sports ? Do you like go to the cinema? What is your boyfriend name? We will share the full video very soon!!! with P5 we were reading the book "Toto, the monster". they created their own monster, named it, and draw the new "home" for him... and we have them living in really funny places! what's his name? Where he live? 5th grade. Message for Queralt Coves! we are Júlia and Jana. We know that today you are in the Hospital (Sant Joan de Deu). We wish you all the best! Remeber Queralt "everything is fine" like our film. Look what we are looking at in english class: Tiny houses!!! Next day we will do it together. 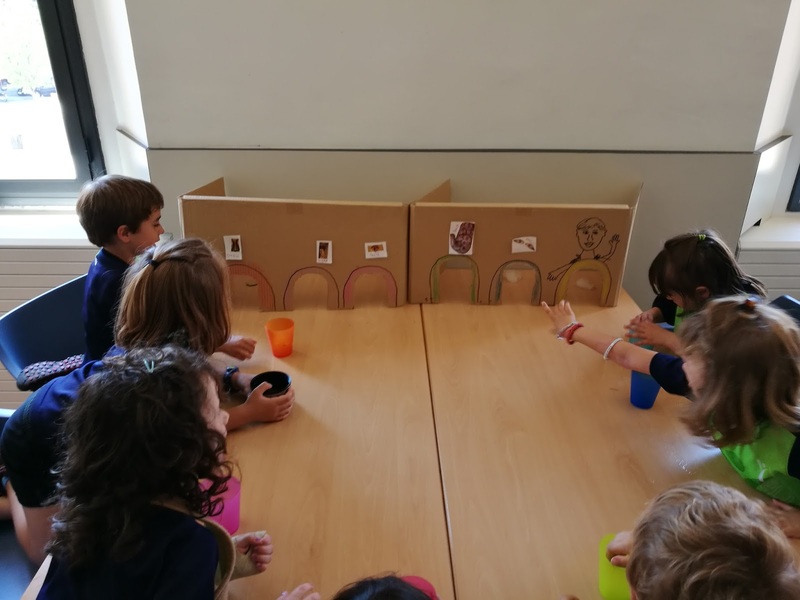 Two weeks ago we did this activity to learn more words about food. Firstly, we painted the dough and the ingredients; secondly, we cut them and, finally, we pasted them on a posterboard writing the names of the ingredients, too. Here below a photo taken to Julia as she was the first to finish it. More photos of our children at work and the fantastic pictures they made! As we already announced, we watched"Bedknobs and broomsticks, a 1971 British-American musical fantasy film produced by Walt Disney. After that, our students did an activity called "My magic bed" in which they had to draw and paint their own bed, inspiring themselves on the movie, or not. This week 3rd grade has visited the market. The two day-per week group had been doing activities about fruit and vegetables, like their colleagues from the three day-per week group. So, this visit must be done! After having visited several stands, and having done a great job, and having had a good behaviour, as well we enjoyed eating some sweets. We played a game outside. The children had to move their fishes to different places...in the water...out of the water.....in the pot ...on the grass but then it began to rain so we used the fishes as umbrellas ...perfect !.... and loads of fun !